In LiveEngage, select Campaigns. In the footnote, select Data sources. 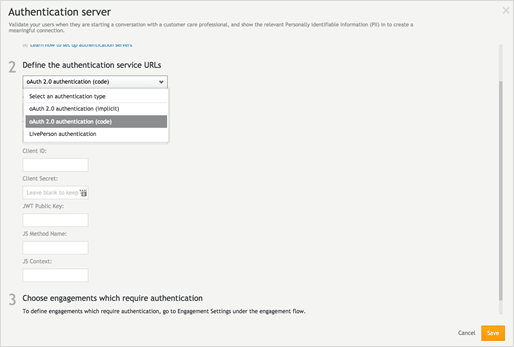 In the Connectors area, next to the authentication server, click Configure. The Authentication Server page is displayed. There are actually 2 versions to our Auth service - the "openID" (backwards compatible - default) version, and the "OAuth 2 RFC" (non default) version. If you already have a working authentication configured - chances are you're working with the "openID" version. If you're setting up authentication for the first time - chances are you want the "OAuth 2 RFC" version. Starting with version 9.3.0 of the Unified Window (May 2018) - all newly created authentication connectors will use the "OAuth 2 RFC" version by default. In the "openID" version (External window) we call the Authentication Endpoint with a "redirect_uri" query parameter that redirects to the external window, and it contains encoded query parameters that the window needs. In the "OAuth 2 RFC" version the "redirect_uri" query param is clean and contains no query params of its own. What we used to pass as query parameters we now pass as a separate encoded "state" query parameter, which is parsed by our external window. To support this - the Authorization Endpoint must pass the "state" query param which it receives to the external window as is. In the "openID" version (External code flow) we pass a single redirect_uri to the Token Endpoint (either provided by the customer page or "https://liveperson.net" by default), while the Authorization Endpoint uses the redirect_uri to redirect to the external window. In the "OAuth 2 RFC" version we always pass the location of the external window as the redirect_uri - to both the Authorization Endpoint and the Token Endpoint. In the "openID" version (External implicit flow) we call the Authorization Endpoint with a query parameter "response_type=token" to denote that it's implicit flow and we expect to receive a JWT. In the "OAuth 2 RFC" version we use "response_type=id_token". Please contact your account team at LivePerson support.